When I started homeschooling 5 years ago, I didn’t know what to teach for music. I didn’t know how to play any musical instrument and I only knew the basics of music theory. So I decided to teach music theory to my 1st grader based on what I have studied before. Fast forward, my daughter knows how to play the keyboard and read notes. Though I don’t take any credit for that since she basically learned it on her own. But as a homeschool mom, where do you begin? Teaching music should be fun and practical, but it should also help your children understand the dynamics of music. I’m listing down some of the beneficial links to help you teach music theory to your children. Here are the links to help you teach music appreciation to your children. Note that there are some links where you need to purchase the curriculum. These are the links to some free music curriculum. I am not good with musical instruments. In fact, all I know about music is music theory! I didn’t know how I was supposed to teach my children music lessons but it turns out, as I taught my daughter about music theory, she picked up the lessons and started learning to play the keyboard on her own. For my son, I did the same technique but it didn’t had the same effect on him. After teaching him the music theory, he didn’t proceed to learning the keyboard instead, he became more interested in guitars, like the yamaha cgs102a guitar. We have one at home but it was still too big for him so we bought him a small one. We tried to learn it together but without a guide I just didn’t know how to help him. Now, he has a Ukulele and has been learning to play the chords. The Ukulele comes with a how-to so it’s been teaching him. Hopefully, this time we would have success with the Ukulele. Help! I Can’t Teach Music! When I was younger, I have often dreamed of learning to play musical instruments. Unfortunately, that dream has never been realized. I don’t own a keyboard or an ETC Source 4 wire or know anything much about guitars. But because I now have kids, I certainly hope and pray that they will do better than me. I’m grateful that my daughter can play songs already on a keyboard that was loaned to her. She seems musically gifted as she can play music while reading some music sheets and study music on her own too. But for my boy, it is entirely a different story. I don’t know how to teach him music or how to play the keyboard. He doesn’t seem to be interested. We even bought him his own mini guitar, but sadly, it has been a year since, he still hasn’t learned how to play it yet. Do you have any tips on how I can teach music lessons to my son? I’ve never learned how to play the piano and I don’t want my kids to experience the same. Thankfully, we were given an opportunity through the Schoolhouse Review Crew to review HomeschoolPiano. We received a lifetime subscription for up to five students for HomeschoolPiano – Complete Set of Books. This would give my children an opportunity to learn playing the piano even while at home! 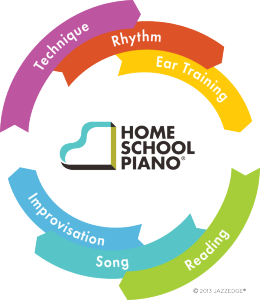 HomeschoolPiano offers piano lessons online. The lessons are all-video based and is made for all ages! If you are a beginner or you already have prior lessons, HomeschoolPiano can help you read music and even create your own music! This is perfect for learning piano at your own pace since you can view the lessons anytime of the day from your computer or your mobile devices like the phones or tablets. The program is a well rounded music curriculum as it follows a 6-steps cycle which lays a foundation based on the National Standards for Music Education. In every unit, the lessons center on the following fundamentals: Technique,Rhythm, Ear Training, Reading, Song, Improvisation. This ensures that the students learn how to develop their ear, read music and create their own music and improvisations later on. There are a total of 4 books, the Core Piano, Book 1, Book 2 and Book 3. Core Piano is a collection of 30 lessons teaching piano essentials. It is a must for those who have no previous piano experience. Book 1 is for the absolute beginner, Book 2 is for those who have some previous piano training and Book 3 is for the advanced student where he will learn to create piano rich arrangements. There are 7 lessons in each unit and 6 units in each Book. Every lesson ranges from 5 to 10 minutes in length. After watching the video, it is expected that the student will practice what he has learned on his own keyboard or piano. 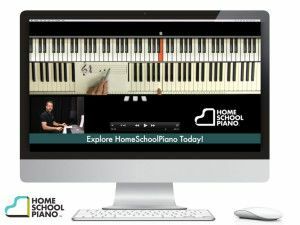 To use HomeschoolPiano, you need to have reliable internet connection and a piano or a keyboard with at least 49 keys. You may use your computer or your tablets since you don’t need any special software to view the videos as you access them online. If you can not watch the video online, there is a link which allows you to download the mp3 file for audio and mp4 for video. HomeschoolPiano can be purchased in 2 ways. Through the Success Package which means you have to pay $299 in one payment or the Payment Plan which means you can pay $99.97 per month for 3 months. 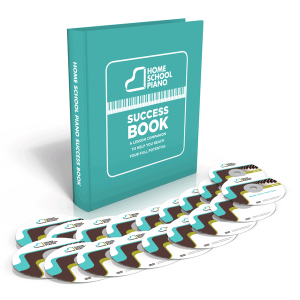 You will have unlimited life-time access to HomeSchoolPiano along with all bonuses (downloads, jam tracks, sheet music) for up to 5 students. I created 2 logins for my 2 children. My 10 year old daughter started with Core Piano for 3 times a week. She has previous piano experience so she breezed through most of the lessons in Core Piano, then she worked on Book 1. She also took the lesson quiz to assess her knowledge. After watching the video, she follows the instructor’s lessons on the keyboard so she remembers what she has learned. It usually takes her a total of 30 minutes per day to complete about 2 lessons. My 7 year old son has no previous music or piano lessons so he took the lessons slower. He also started with Core Piano and is still watching Core Piano. He did the lessons twice a week. After watching the videos, we usually do the activities. Like when the lesson was about skip or steps, I asked my son to create his own steps scale and skip scale. – It requires no assistance from me. I just made sure that they were properly logged in and doing their piano lessons. – The continuinity of the lessons were important so that the student were learning efficiently. I am confident that they are not missing any foundational lessons. – My children can repeat the video lessons when needed. My daughter breezed through Core Piano and was excited to work on Book 1, but there were times when I asked her to check some topics in Core Piano again to remind her of the basics. – I liked it that my children were learning music without us having to leave the house or hiring a piano teacher, since our budget can not accomodate it at the moment. – One program for both kids. Since this product is for all ages, we can use it for both of our kids. – The creative side of my children is also being trained as they are continuing on with their lessons. They are encouraged to vocalize and improvise. – There are online quizzess to check whether they are learning their lessons. – We have unlimited lifetime access to a program that can be used for a couple of years. The most challenging aspect of this program for us is our internet connection. There were days that we had a hard time accessing the video online because of our slow or intermittent internet connection. Another factor is that we have to be consistent in watching and practising the new learnings. As with most programs, it is up to the diligence of the student if she wants to learn and make the most out of an amazing product. If you are looking to learn piano at home and unleash your musical side, this is a good product to try out. For more information, you can check HomeschoolPiano Facebook or at HomeschoolPiano Twitter or at HomeschoolPiano Pinterest.